Ariel Thongsaly is the owner and designer behind The Knitted Sisters, is a follower of Christ, wife, mother to two boys, and a maker. She has been knitting/crocheting since 2013 and has found her calling. When she isn’t working she is spending time with her family and fur baby Amira, crocheting/crafting, or watching movies. Hello beautiful people, my name is Ariel and I am the designer of The Knitted Sisters here in Las Vegas, NV. I have a list of questions that people always seem to ask me so I decided to share them with you before we get started. Question: Is your favorite Disney Princess Ariel? Answer: No, actually my favorite Disney Princess is Jasmine. Answer: I grew up a very independent woman and a big feminist, all of the other princesses needed a man, but Jasmine was portrayed being independent, and when she did find someone she didn’t change for him. Plus she had a freaking tiger...who doesn’t want a tiger as a pet? Question: Where you named after the Disney movie? Answer: No my name is actually Hebrew and means (male/female) Lion/Lioness of God. My mother heard the name when she was in elementary school and it stuck with her. My mother gave me my middle name after my great grandmother though. Question: Do you live in a casino? Answer: No, I might live in Las Vegas, but the home I grew up in was very far away from the Downtown or The Strip. I went to church every Sunday, had youth group every Wednesday, etc. I was away from all things Sin City related until pretty close to adulthood. Now you know my frequently asked questions! The Knitted Sisters started out first as a hobby that my younger sister Kira, introduced me to. One of my friends helped me pick out my looms and some yarn and I began loom knitting baby items, such as baby booties, blankets, etc., for my son Ren. Eventually I moved onto crochet and now I am learning how to knit. Throughout my life I have always gravitated towards all things crafts. My soul needs to create, no matter what it is. I want my designs to be handmade, but not look it. My hope is to create items that are fashionable, I love finding new ways to use stitches and I want all shapes and sizes to be able to wear and make my items. The biggest issue I have come across in life is where I fit in and what I want to do with my life. It is a place we all find ourselves eventually. When I was introduced to crochet, I was hooked! It keeps me calm and happy. I am now apart of this amazing community that I am building real relationships with. I know how powerful it is to have this community here. The pattern I am sharing with you today has probably been one of my favorite patterns to make to date. When I received the notice that I was going to be sharing a pattern here on the blog, I realized I need something special. It took me a while to come up with this, but it was worth it. My favorite part is that you can wear it as a summer top or a swim top. It looks difficult but it works up super quick. You just need to learn the stitch, increases, and decreases and you are set! The goal for this pattern was to make something that was inspired by Jessica herself. I realized that she has been a huge part of my journey as a maker and has inspired me to strive for what I want. This is a true honor so I want to say a huge thank you to Jessica and The Hook Nook for allowing me to share my creative soul with all of you! This is the stitch that makes up the texture of the top. It is worked in two rows. Row A: DC, SC, DC until end of row. Row B: SC, DC, SC until end of row. You will begin and end the row in the same st.
To increase the row before must be Row A of Seed Stitch Ch 2, DC then SC into the first st. At the end of the row SC then DC into the last st. This stitch is to decrease in the pattern, yo, insert hook into the next st & pull up a loop, pull through two sts on hook, insert hook into next st & pull up a loop, then pull through three. This stitch is to decrease in the pattern, insert hook into the next st & pull up a loop, yo, insert hook into next st & pull up a loop, pull through two sts on hook, then pull through three. For every ch st in this pattern it does not count as a st. These stitches are turning chains only. Use the sizing chart to determine what size and how many sts to ch. Size XS & S - cut a long tail. Size M & L - cut a long tail. Size XL & XXL - cut a long tail. XS & S - cut a long tail. *M & L - cut a long tail. Then go back and repeat rows 29-34. Place the front piece down flat with the RS facing up, then line up the back piece on top of the front piece with the WS facing up. Use the tapestry needle to wh st the front and back pieces of the sleeves together using the long tail of yarn. Wh st the sides together using long tails. Using XS (S, M, L, XL, XXL) - Measure 6.5 (6.5, 7, 7, 7.5, 7.5) inches from the top of sleeves towards the bottom and place a st marker. Using the yarn tail, wh st the left side seams together starting from the bottom, wh st until you get to the st marker or customize until you get the right fit. Then tie off. Repeat with the right side seam. Flip item RS out and find the seams. Using the 8 mm crochet hook pull up a loop on one of the seams then sc around the bottom until you get to the end, then sl st into the first st, cut a tail, and tie off. Using the 8 mm crochet hook pull up a loop on one of the seams then sc2tog, sc around the bottom until you get to the next seam then sc2tog on the one side, then sc2tog on the other side of seam, continue to sc until 2 sts before end then sc2tog, then sl st into the first st, cut a tail, and tie off. Using XS (S, M, L, XL, XXL) - Place st marker 6 (6, 7, 7, 8, 8) sts away from the right or left seam in the front, then 7 sts away from that first stitch going towards the middle of the front. Pull up a loop on the other side and repeat rows 4-14 (or until desired length). If you would like to create an edge to the bottom and the sleeves just bring up your yarn with the 8 mm crochet hook and sc around the edge then sl st into the first st and tie off. Row 1: Using 8 mm crochet hook and pull up a loop, then sc around until one st before the st marker, skip the st marker and sc into the next st (this makes the V in the neckline), continue to sc around and then sl st into 1st st, cut a tail and tie off. You can block it, line it, or leave it as is. Now all that’s left to do is show it off! I had so much fun designing this for you and I can not wait to see all of your finished pieces! Don’t forget to tag @theknittedsisters in the photos of your tops! Feel free to follow me on Instagram for upcoming patterns, giveaways, and more! 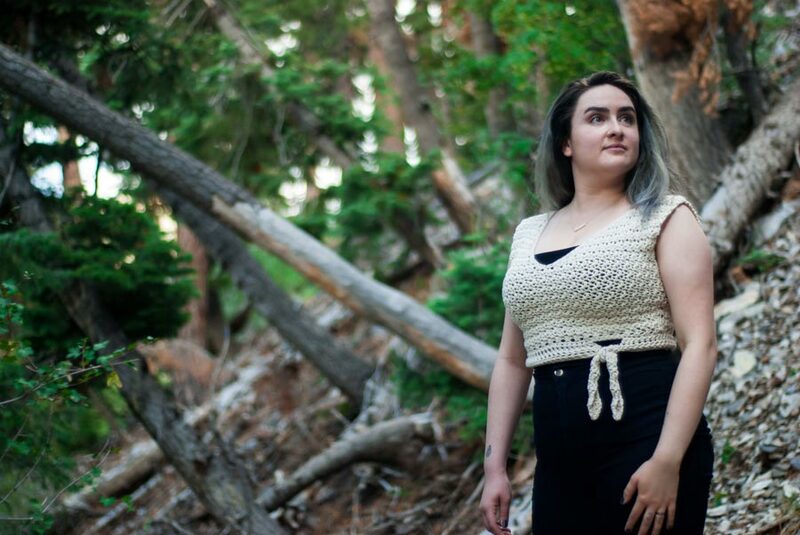 I have also just launched a new website (https://theknittedsisters.wordpress.com/) that I will be posting free patterns on and little helpful hints and tips I have learned over the years! 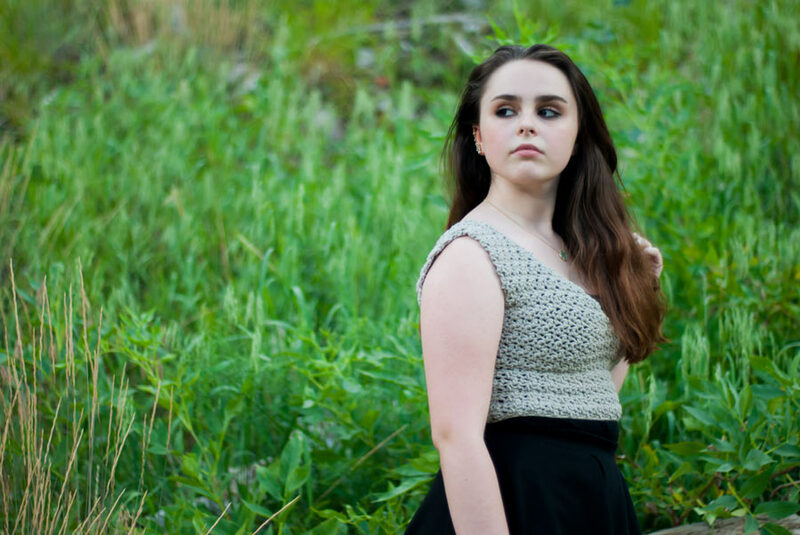 If you have any questions or need help with the pattern please email Ariel at theknittedsisters@gmail.com. You can use the pattern to make items for your shop, but please credit Ariel at The Knitted Sisters as the designer.